When buildOn Haiti Country Director Suze Charles arrives in a rural community to start a school building project, it’s the determination of the village mothers she usually notices first. Serving a country where nearly half the population lives in poverty and illiteracy, Suze knows that a the will of a strong mother to educate her children can make all the difference in the world. It’s a lesson she first learned from her own mother, who sacrificed to make education a top priority for Suze and her four siblings. 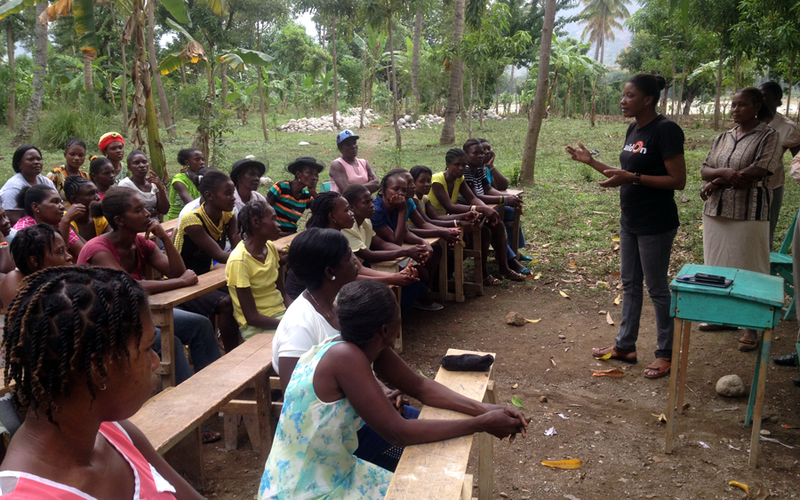 Pictured: buildOn Haiti Country Director Suze Charles leads a community meeting with the women of a rural village as they organize to build a school. Many of these women are illiterate and see in Suze an example for themselves and their children. 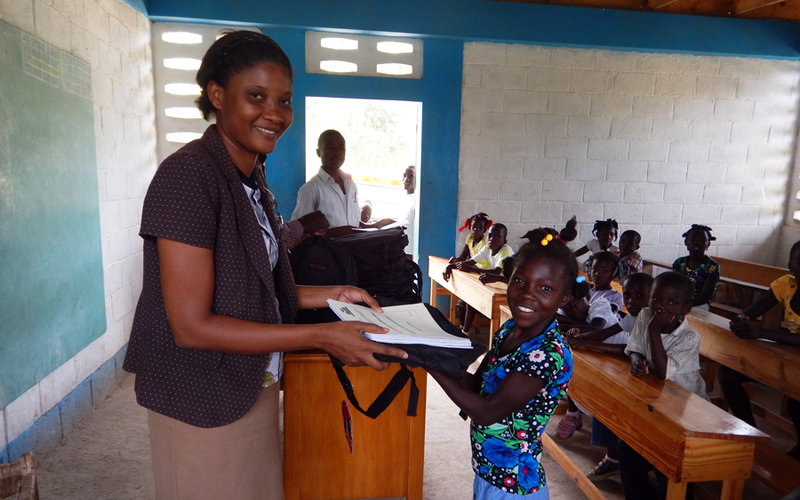 Suze’s mother, Anite, and her father were both forced to quit school to support their families at young ages. So when they started a family of their own, they were determined to see their children finish their education. Both parents worked hard, Anite as a tailor and Suze’s father as a farmer, so that their children could stay in school. But when Suze was in her last year of primary school, her father unexpectedly passed away, and her mother was left to support the children on her own. The family had been living with Suze’s late father’s family, who almost immediately asked Anite and the children to move out. Discouraged but not dissuaded, Anite rented a small, uncomfortable house for the family. Keeping her job as a tailor, Anite also began harvesting produce to augment her income so that her children wouldn’t have to quit school to support the family. When the time came for Suze and her siblings to leave their village for high school, Anite used all of her income to rent a house for them in Port au Prince. Now, as Haiti’s first female Country Director, Suze sees the strength and determination of her mother reflected in the women she works to empower in rural Haiti. Pictured: Suze visits a buildOn classroom in a small village, providing a positive example for the students, especially the girls. In one of her roles as Country Director, she visits each village that will be receiving a buildOn school to share buildOn’s mission and methodology with the community. During these meetings Suze speaks directly to the parents who will be volunteering their labor to build a school for their children. “When I see the excited and dedicated mothers, it reminds me of my own mother, and how driven she was to see her children succeed,” Suze says. As Country Director, Suze is a role model for women and girls across the nation. She arrives in villages like the one where she was raised, seeing women who remind her of her mother, and she lifts them up, inspires them, and shows them what can be accomplished through education. “My message to the women of Haiti and to the world is something I learned from my mother: to have patience, courage, and determination. You can come out of your problems and you can succeed,” Suze says. And, it is through Suze’s own patient and courageous leadership that she’s breaking the cycle of poverty, illiteracy and low expectations – for Haitian people of all genders. Suze is one of three female Country Directors employed by buildOn across the globe. To learn more about buildOn’s commitment to gender equity in the classroom, on the worksite, and in our organization’s leadership visit buildOn.org/stronger-together.